For most of us, the laundry room is nothing but a dull place. However, that doesn’t mean that we can’t make this room more user-friendly. By more user-friendly, I mean more useful and organized. How can we turn the laundry room into a section that we will love to go into? 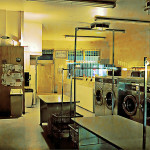 The laundry room is usually a small, cramped and cluttered space, right? In most cases, laundry rooms are pretty spacious, but their space is rarely utilized. 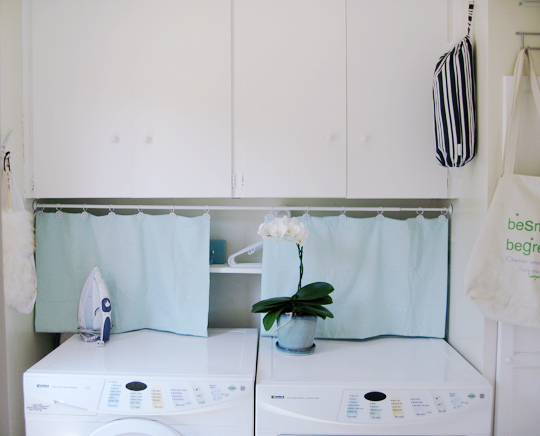 Now since you’re reading this article, I assume you have probably realized the usable space potential in your laundry room, so check out these tips in laundry room design! The wall that is behind the washer/dryer has pretty large storage space. Let me guess: you probably have only one shelf above the washer/dryer, meaning you’re only utilizing a small portion of that wall. No wonder you feel like you don’t have enough room to put anything behind it! How can you use that space to its full potential? Well, you can start by building a rubber coating platform that will go underneath your washer/dryer combo. This way, not only will you cut down on noise from the combo, but you will also get space for whatever fits in: storing out-of-season clothing, linens, etc. 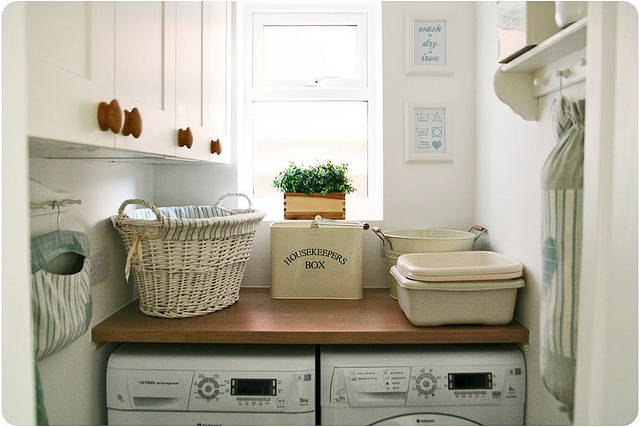 Have you ever thought of laundry room workspace? How does countertop for folding sound to you? You can place a cabinet under the countertop for the laundry detergents bottles or boxes. Installing small shelves or buckets is also a good idea. Yes, I used “décor” and “laundry room” in the same sentence. Laundry room décor ideas do exist. When it comes to designing a room, the laundry room usually slips in people’s mind. 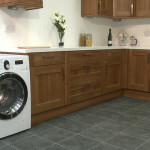 Nevertheless, with a little bit of attention, you can turn your laundry room into a space you’d love to go into. Long gone are the days when this room was a dreaded dank dungeon. No matter how dark or small your laundry room is, now it’s the best time to transform it into a welcoming space. You can start the transformation with painting the walls your favorite color. I suggest choosing energetic and bright shades like orange, yellow, green or blue. Why not placing pictures to give character to the walls? If painting is a hassle, you can add pictures. It doesn’t matter what kind of pictures you will add; the laundry room is a place that allows you to be liberal with the wall decoration choices. My favorite part – getting the nature involved. It doesn’t matter whether you’ll choose artificial or real plants – they will add color and life, infusing your dull laundry room with vitality. And finally, make sure that the shelves, hampers, racks and baskets blend well with the characteristic of the laundry room. There are many other décor ideas, but by incorporating these easy tips, you and your family members will notice a huge difference. You can be liberal, so don’t be afraid to try something new and be creative.